If a business chooses to impose a surcharge on its customers for making a payment using a credit, debit or prepaid card, the level of the surcharge must not be excessive. Our questions and answers provide detailed information about the ban. When does the ban start? What is a payment surcharge? When will a payment surcharge be excessive? What costs can be included in a payment surcharge? How do I calculate my permitted surcharge? Can I still charge a handling fee or a processing fee? Can I impose one surcharge on all payment types? Can I impose a flat fee surcharge? Can I set a minimum transaction value in order to use EFTPOS services? How often do I have to review the level of my surcharge? What if my acquirer or payment facilitator does not give me a statement? I am a new business/I have recently changed my bank, so how do I set a permitted payment surcharge level if I don’t have the necessary details? What powers does the ACCC have? What are the penalties if my business breaches the new law? The ban on excessive payment surcharges applies to all businesses, regardless of their size. The ban was implemented in two stages. It applied to large businesses from 1 September 2016 and it commenced applying to all businesses on 1 September 2017. When a business accepts payment for goods or services by a debit or credit card, it usually incurs costs for processing the payment. Some businesses include these costs in the price they charge for their goods or services, and others pass the costs on as a payment surcharge. You are not required to impose payment surcharges on your customers and if you continue not to impose a payment surcharge then this ban will have no effect on your business. However, if you impose any additional charge on your customers for processing payment, or a charge which differs according to payment method, you are imposing a payment surcharge and you need to think about whether the surcharge is in line with your applicable costs of acceptance for each payment type. The Reserve Bank of Australia (RBA) decides what payment types are covered by the ban. The payment types that are not covered by the ban include: BPAY, PayPal, Diners Club cards, UnionPay, American Express cards issued directly by American Express, cash and cheques. Merchants are not prevented from applying surcharges to transactions in these systems. For example, American Express, Diners Club and UnionPay have provided undertakings to the RBA that enable merchants to surcharge, while PayPal has modified its User Agreements to remove its previous ‘no-surcharge’ rule. While they are not subject to the regime that enables the ACCC to take action against excessive surcharges, these payment systems may have rules or terms and conditions that seek to limit the surcharges applied by merchants to the cost of acceptance. A payment surcharge is excessive if the surcharge exceeds the permitted surcharge as defined in the RBA standard. The permitted surcharge is an amount not exceeding your costs of acceptance for each designated payment type. The RBA has said that as a guide, payments through the domestic eftpos system (used to process payments from debit cards) are usually quite low, mostly below 0.5 per cent. Accepting a Visa or MasterCard debit transaction may cost a business around 0.5-1 per cent of the transaction value. Credit cards usually have a higher cost for businesses, and may cost up to 1-1.5 per cent for Visa and MasterCard, and between 1.5-2 per cent for an American Express card payment. It is important to note that different businesses have different costs of acceptance. In general, smaller merchants’ costs might be higher than these indicative figures. any other fees incurred in processing card transactions, including cross-border transaction fees, switching fees, and fraud related chargeback fees (but not the cost of any actual chargebacks). the cost of insuring against forward delivery risk. In each case, these costs must be specific to the particular types of cards that you are surcharging, rather than being costs that apply to all payment methods accepted by you. Furthermore, these must be costs paid by you to an external provider and verified by contracts, statement or invoices. For most businesses, calculating your permitted surcharge is quite simple. All of the standard card acceptance services which are supplied to you by your bank or payment facilitator are set out in the monthly statements you receive from them. The statements outline your cost of acceptance for each applicable payment type expressed as a percentage of the value of a transaction. and you want to pass on these costs in a payment surcharge then you will need to calculate your permitted surcharge yourself. No other payment service provider costs can be included in a payment surcharge. You will need to calculate the proportion of these costs applying to particular systems, allocating costs based on total transaction values for each system over the previous year. The RBA guidance material contains some additional information to assist you with this. Remember, the only non-acquirer, non-payment facilitator fees (that is, fees which do not appear on your monthly statement) allowed to be included in your cost of acceptance calculation are these four elements, and they must be documented or recorded in a contract or invoice provided by the payment service provider. They must also be costs that apply to cards but not to other payment methods. You may need to provide these documents to us if we issue you with a surcharge information notice to examine the level of your surcharges. The ban does not prevent a business from charging fees that are genuinely unrelated to payment methods. However your business will still need to comply with its existing obligations under the Australian Consumer Law. That is, you will need to include all components that make up the price of your goods or services in the advertised price, where they can be quantified. You will also need to ensure you do not mislead consumers and you need to provide adequate disclosure and be clear about the nature of the fee and the circumstances in which it applies. To be clear though, if you impose a fee, however you describe it, that is payable on some payment methods but not others, then it is likely to be a payment surcharge. The ban will apply and the amount that you surcharge will be limited to your costs for accepting that payment method. Yes you can in certain circumstances. Different payment methods will typically have different costs of acceptance. This will be set out in your monthly statements – a customised percentage will be provided for each relevant payment type (for example an individual percentage for MasterCard credit, another for American Express credit, another for Visa Debit etc). If you wish to impose a single surcharge across multiple payment types, you must set the surcharge at the level of the average cost of acceptance of the lowest cost system; that is, no higher than the lowest permitted surcharge. If your average cost of acceptance for Visa Debit is 1 per cent, for Visa Credit is 1.5 per cent, and for American Express is 2 per cent, you would be permitted to charge the same level of surcharge for each payment system, but it would need to be 1 per cent as that is the lowest of all payment systems. You would not be allowed to use the average of those three figures (that is, 1 + 1.5 + 2 = 4.5 divided by 3 = 1.5 per cent). Yes you can, but it will normally be easier for you to apply a surcharge in percentage terms, if you choose to impose a surcharge in the first place. In most cases your payment costs are charged to you in percentage terms, so it will typically be appropriate that any surcharge you impose will also be expressed in percentage terms. The ban does not prevent you from imposing a payment surcharge as a flat or fixed fee, however you will need to ensure that the amount of the surcharge does not exceed your cost of acceptance for any given transaction. If your bank or payment facilitator charges you on a flat fee basis (this is less common than costs being expressed as a percentage) then you can apply a flat fee surcharge. This will be made clear on your monthly statement. Be careful of imposing a flat fee surcharge where the cost of a transaction is relatively small. In those circumstances the surcharge is likely to be excessive. If you charge your customers a one per cent surcharge for paying by credit card, and a customer buys a coffee for $4.00, the surcharge would be four cents. 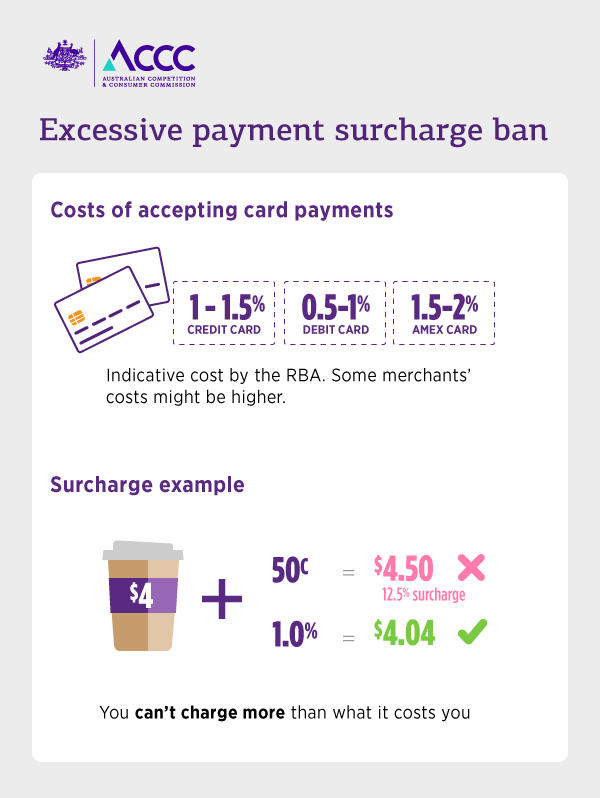 If you charge your customers a 50 cent surcharge for all card payments on transactions less than $10 and a customer buys a coffee for $4.00, that 50 cent surcharge is effectively a 12.5 per cent surcharge, which would exceed your cost of acceptance for that transaction. Yes, businesses are allowed to set a minimum transaction value for the acceptance of EFTPOS cards (or other cards if they wish). They don’t have to offer a card payment option, but they need to comply with the excessive surcharging rules regardless of the cost of the product. For example, if a business sets a minimum transaction level for EFTPOS transactions of $10 and also says that transactions under that amount will incur a 50 cent fee for card purchases, then that fee would be considered as being a ‘surcharge’ and need to comply with the surcharging rules. You should only have to review the level of any surcharge once a year. Your costs of acceptance for some payment methods may fluctuate from month to month based on the mix of cards presented, and this will be shown on your monthly statements. You may wish to reset your surcharge levels frequently based on these monthly statements. However, the RBA standard has been designed so that you will be able to analyse your payment costs once a year, using your annual statement and any other applicable costs, and set your surcharge for the next year based on this information. Acquirers (banks) are required under the RBA standard to provide monthly and annual statements to their customers (businesses) from 1 June 2017. The RBA has worked with the banks to ensure that the statements clearly set out merchants’ average costs of acceptance for each card scheme. If a bank provides payment processing services to a business indirectly through a payment facilitator, then the acquirer must ensure that the payment facilitator provides these monthly statements to its customers. You should receive a monthly statement either from your bank, or from your payment facilitator, depending on how you obtain payment processing services. If you are not receiving monthly statements, you should contact your bank or payment facilitator and ask them to provide these to you. If this does not work, contact the RBA. If you do not have the details on which to base your permitted surcharge, there are things that you can do. The RBA standard allows you to make an estimate of your payment costs in good faith, based on the information you do have available, including any monthly statements you have received. Remember, we have the power to require you to provide documents or information to us, which we can use to check whether any estimates made are reasonably calculated based on available information. The ACCC is responsible for enforcing the ban. We can issue surcharge information notices to businesses, and banks, requiring them to provide evidence of the actual costs incurred by a business for accepting a payment method. That information can be used to determine whether or not a surcharge imposed by a business was ‘excessive’ i.e. greater than the cost charged to it for accepting payment by that method.